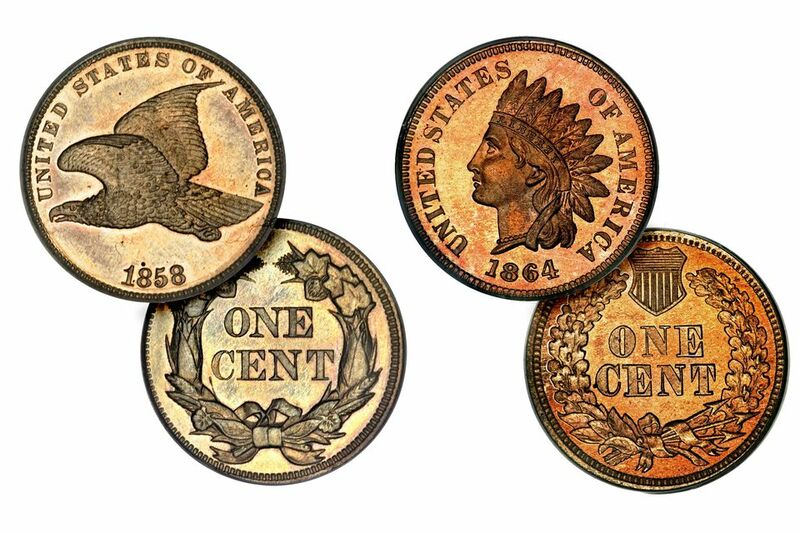 Although Indian Head pennies and Flying Eagle cents are two separate coin types within the small cent category of United States coins, however, they are most commonly collected together. Collecting them together is due to the Flying Eagle cent being produced for only three years. In fact, the 1856 Flying Eagle penny is considered a pattern coin since it was never officially released for circulation. Given its extremely high price, some coin collectors omit this rare pattern coin from their coin collections. The United States Mint produced all of the Flying Eagle cents at the Philadelphia mint, and so were all of the Indian Head pennies except for some small mintages in 1908 and 1909 that the mint produced at the San Francisco facility. A beginning collector will want to start their collection by acquiring a type coin at an affordable cost that fits within their coin collecting budget. An intermediate collector will strive to assemble a date and mint set in circulated condition. The advanced collector looking for a challenge will endeavor to gather a complete set of Indian Head pennies and Flying Eagle cents in uncirculated condition. The advanced collector will try to collect both of these series including all die varieties and proofs. A beginning coin collector will want to acquire a Flying Eagle type coin in circulated condition that will cost between $30 and $40. The intermediate and advanced coin collector will want to purchase an uncirculated specimen that will run between $600 and $700. For the Indian Head Penny, the choices are more varied due to its 51-year production history. A beginning coin collector can obtain a circulated coin with excellent eye appeal for approximately $10. Look for a coin dated 1879 or later from the Philadelphia mint for your best value. Avoid problem coins that have apparent damage like scratches or corrosion on the coin's surface. Additionally, look for a nice pleasing overall chocolate brown color. Collecting a date set of Flying Eagle and Indian Head pennies can save you a few dollars by not having to purchase the scarce 1908-S and 1909-S Indian Head penny. However, this will only be a reduction of two coins since these were the only two Indian head pennies minted at the San Francisco Mint. The set will consist of two Flying Eagle cents (three if you want to obtain the rare 1856 pattern coin) and 51 Indian Head pennies. If you're going to invest the time and money to assemble a set of these coins, you are better off collecting a date and mint set (see below). The most expensive coin in a circulated set will be the 1877 Indian Head Penny. An uncirculated set will involve the purchase of some scarcer dates that include 1859, 1869-1872 and 1877. As previously stated, collecting a date and mint set will only involve the addition of two extra coins: the 1908-S, and 1909-S Indian Head pennies. The most expensive coin in a circulated set will be the 1877 and the 1909-S Indian Head penny. An uncirculated set will involve the purchase of some dates that are scarcer in uncirculated condition that include 1859, 1869-1872, 1877 and the 1909-S coins. The most advanced coin collectors will endeavor to assemble a complete collection of coins that also include Proof issues. The United States Mint at Philadelphia made Proof coins in every year of issue for both the Flying Eagle and Indian Head cents. Adding these coins to your collection will add a significant cost due to the extremely low mintage of these Proof coins. Many factors go into determining the price and value of a coin. As a coin collector, you must develop your coin grading skills to determine an accurate appraisal of your coins. Also, you will directly benefit by learning as much information as you can about the Indian Head pennies and Flying Eagle cents. This includes such things as mintages, die varieties and detailed specifications. The following articles will help you learn these skills and guide your coin collecting adventure of assembling a collection of Flying Eagle and Indian Head pennies. Remember, collecting this classic series of United States coins may take some time. Do not be in a rush to fill the holes in your coin album. Take your time and select problem-free coins within your coin collecting budget that will enhance your collection of Flying Eagle and Indian Head pennies.